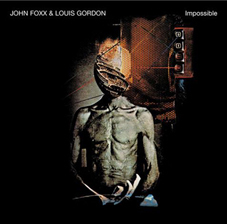 Released for Foxx and Gordon’s autumn 2008 live dates, Impossible is a dark and dreamy album of known tracks revisited. Many of John Foxx’s songs take on a life of their own when played live and they will inevitably evolve. Impossible is an album of re-recorded songs, taking tracks old and new and approaching them in a new way, many of which are similar to the way they have been played live. Several tracks come from Foxx and Gordon's 2006 album, From Trash. If anything, it's "From Trash" itself which has been widely improved, with a sharper, harder, treated vocal, that really gives this song the edge the original version was perhaps lacking. Even if you prefer the originals, it is enjoyable to hear alternative versions and a bit of experimentalism - a word most relevant to the new version of "Impossible", the track which differs the most from the 2006 original. The album opens with a dark and brooding new instrumental, "Adult Concerns", and boasts another brand new track, "Walk This Way", which is one of the finest songs on the album, with a heavy Trans-Europe Express-era Kraftwerk vibe to it. A toned down "X-Ray Vision" works a treat, as does the newly updated Ultravox favourite, "The Man Who Dies Every Day", as performed on the 2006 tour. The final four tracks sound perhaps too similar to the original versions, therefore not bringing much added value. However "Crash and Burn" stands out as the one that has improved on the original, being darker, heavier and worthy of its name. Anybody interested in the visual aspect of John Foxx’s work, then Impossible, as with Neuro Video, is worth investing in for the artwork alone - certainly the most interesting and unusual imagery to grace a Foxx/Gordon album - and limited to only 1000 copies, it won't be long before this CD is a real rarity.